Despite some fluctuating oxygen levels at birth, Lauren Hoel went home from Mayo Clinic Health System in Eau Claire, Wisconsin, shortly after her birth in November 2011. But four days later, when her parents brought her in for a routine well-baby visit, they requested Lauren's oxygen levels be retested. "As first-time parents, we had no idea what normal babies do," Lauren's mom, Anne Hoel, says. 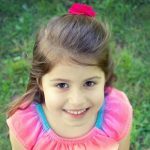 "But because Lauren had low oxygen levels in the hospital and liked to sleep a lot, we asked them to check her level again." Lauren was born with a heart murmur that hadn't yet resolved on its own. That's not uncommon in newborns, but her care team was unable to get a consistently good oxygen level reading despite several attempts with different machines. That's when Lauren's Mayo Clinic Health System pediatrician, Karen Myhre, M.D., ordered an echocardiogram to rule out a major medical issue. The images were sent to Mayo Clinic's Rochester campus where they were read by Allison Cabalka, M.D., a pediatric cardiologist. The results revealed a number of significant heart problems. "She was diagnosed with transposition of the great arteries, an atrial septal defect, a ventricular septal defect and an interrupted aortic arch," Anne says. "It was scary." After her diagnosis, Lauren was transferred immediately to Mayo Clinic by helicopter and placed in intensive care until she had her first open-heart surgery when she was just 12 days old. A second open-heart surgery followed when Lauren was 8 months old, and a third took place in July 2017 when Lauren was 5. While not the most complicated of the three, Anne says Lauren's latest surgery was the most difficult for her to get through because she was old enough to know what was going on and what was about to happen to her body. "She was scared," Anne says. 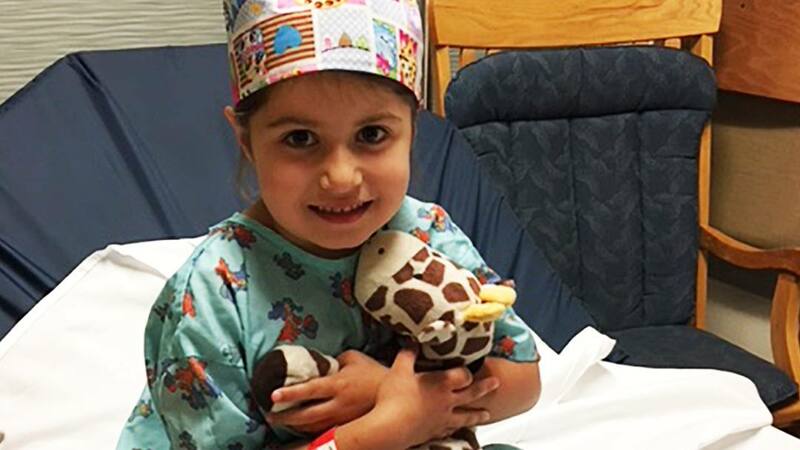 Fortunately, Lauren's surgeon, Sameh Said, M.D., M.B., B.Ch., knew what to do. "We'd heard great things about Dr. Said, so we trusted him to take care of Lauren," Anne says. "But never in a million years would we have expected the level of care we received from him." That care began even before Lauren reached the operating room. "Dr. Said took extra time to explain everything to us in detail," she says. "He made Lauren feel more comfortable before her surgery." 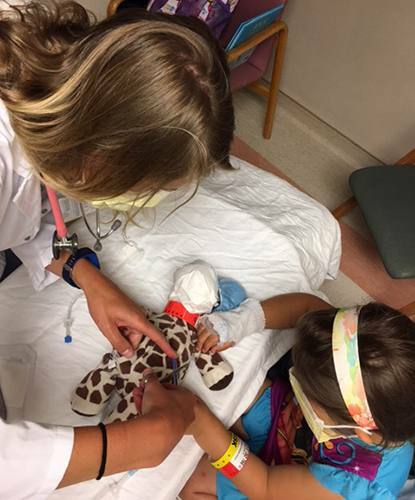 But Anne says the most important and impressive part of Lauren's care came after her surgery — especially as it pertained to Raffie, a stuffed giraffe Lauren had since birth that stayed by her side throughout each of her surgeries at Mayo Clinic. "During our pre-op visit, Lauren had asked Dr. Said if he could fix Raffie's heart, too, and he agreed," Anne says. "And when they came out of surgery, both Lauren and Raffie had the exact same surgical hats, incisions, stitches, IVs, heart-shaped bandages and chest tubes. There were even pictures of Dr. Said performing surgery on Raffie from the operating room. Everything he did to Lauren, he did to Raffie, right down to the last stitch." For a young child (and family) filled with worry, Anne says that gesture was priceless. "There are no words to truly express how much we appreciate the care Dr. Said not only gave to Lauren, but to our whole family," she says. "He helped all of us get through her surgery easier, and we are forever indebted to him for that." For his part, Dr. Said says he wanted to do something meaningful to ease the anxiety he knew Lauren was feeling. "Children of Lauren's age sometimes have some trauma from this kind of surgery because when they wake up, they're attached to all these lines and tubes — all of which are new to them," he says. "So we were just trying to do something to relieve some of that anxiety and tension for her." It worked remarkably well. "It was amazing how it changed Lauren's emotional state and the way she interacted with her care team after surgery," Dr. Said says. "She was much more cooperative and interested in her care." Dr. Said wasn't the only member of Lauren's care team to make her and Raffie feel comfortable during recovery from surgery. Anne says that list also includes Madeline Klossner, the physician assistant who cared for Lauren after she left the ICU. "Dr. Said's rule was that every time Lauren had something removed, Raffie did, too," Anne says, including the chest tubes, which her mother recalls being "the most traumatic" for Lauren. "Madeline and the rest of the staff first showed Lauren how the process would go with Raffie's chest tube," she says. "But after Lauren had her tubes removed, she wasn't in the mood to help with Raffie's. When she was ready, Madeline came back with masks, gloves and a stitch kit to help Lauren take his tube out. Madeline also let Lauren use her stethoscope, which Lauren thought was awesome. Madeline took extra time to help Lauren get in on the action, learn about medicine and inspire her. And she did it all with a smile." As did cardiac ICU nurse Marlene Carlin. "We've known Marlene since Lauren's first surgery at 12 days old," Anne says. "She cared for Lauren as if she were her own when Lauren was in her most critical state, nearly dying. We now specifically request her every time Lauren's in the hospital. She continues to care for Lauren as if she is her own daughter, and as a parent that means the world to us. She even included Raffie in the handoff to the next nurse, which carried over throughout Lauren's hospitalization." And then there was Dr. Cabalka, the pediatric cardiologist who started it all by reading Lauren's first echocardiogram images at 4 days of age. "She was both honest and caring, conveying Lauren's shocking diagnosis to us in a professional and compassionate way," Anne says. "And she's maintained that professionalism and compassion throughout our nearly six years of working with her. We feel so lucky and fortunate to now have her as Lauren's primary cardiologist and that she comes to Mayo Clinic Health System in Eau Claire to see Lauren for her follow-up care, so that we don't have to travel so far to see her." Thanks to the care she's received over the years, Lauren's living the life of a normal, healthy 6-year-old girl. "She's a thriving kindergartner right now," Anne says. "Her activity level has increased, and she enjoys running around and playing. Her favorite sport is gymnastics." For that and everything else, Anne would like to say a sincere thank you to all those at Mayo Clinic who made it happen. "We are truly indebted to every member of Lauren's care team for going the extra mile to provide exceptional care to her," she says. 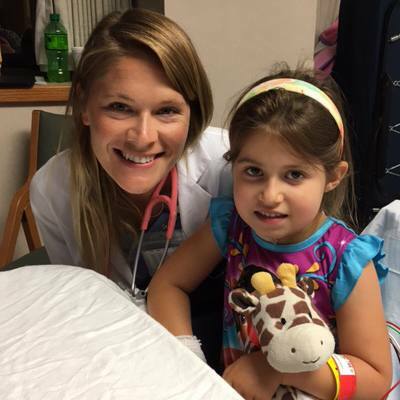 "I would highly recommend Mayo Clinic's Pediatric Cardiology and Pediatric Cardiovascular Surgery departments to anyone. Lauren has been a complicated patient overall, and they've taken exceptional care of her from day one." Learn more about transposition of the great arteries, atrial septal defect, and ventricular septal defect care at Mayo Clinic. Read about Pediatric Cardiology and Cardiovascular Surgery. Explore Mayo Clinic and Mayo Clinic Health System.